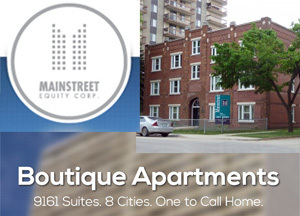 Mainstreet Equity Inc., “an add-value consolidator of mid-market multi-family apartment buildings,” is in ‘full on’ growth mode. In fact, the only thing slowing its growth is a lack of product to buy. The Calgary-based public company (MEQ-T) could acquire 3,000 to 4,000 units in its three markets of Alberta, Saskatchewan and British Columbia, if sellers put product on the market, said Johnny Lam, the company’s chief financial and chief operating officer. Euro Pacific Canada real estate analyst Rob Sutherland expects the company to be a busy buyer. “We expect the company will use its ample liquidity to operate under (Warren) Buffett’s idiom of being greedy when others are fearful and we expect a continual and substantial acquisition pipeline,” he wrote in a report this week. Mainstreet sees a “very slow” Western Canada market as both buyers and sellers are waiting to see how the impact of lower energy prices shakes out, plus the new complication of the first NDP government in Alberta’s history. Lam is patient and said political changes may spur some owners to trim their holdings in the cooling Alberta market. “I think we can get a much better deal later on – I hope we are right,” he said. Last year, the company purchased 500-600 units and so far this year has purchased 400 and hopes to announce new acquisitions soon. “We are actually working on a couple of big projects and hoping we can get some pretty good cap rate deals,” said Lam. Mainstreet’s sweet spot for acquisitions seems to be properties with less than 100 units, a group characterized by mom and pop ownership, “owner neglect and mismanagement,” long-deferred maintenance, lower vacancies and lower rents. Targeting those buyers has worked well for the company as it started out in 1998 with 272 units and today owns and manages 9,159 units with a market value of about $1.3 billion. The company believes its current strategy makes the greatest sense because apartments are trading “significantly” below replacement costs currently, which also means little new product is coming onstream. Meanwhile, economic fundamentals remain healthy – even in Alberta. In Edmonton, Mainstreet’s most important market where it owns 3,725 units, the 2015 forecast vacancy rate is just two per cent with a rental universe of about 60,000 units and just 40,000 mid-market apartments. Buoying Edmonton’s apartment picture is expected 2015 net migration of 24,000 and an “ownership premium” of $763 per month – the principal and interest for the average resale home minus the average two-building apartment rent. (Mainstreet’s calculate premium is actually much higher in Calgary where it was $1,206 for 2014). Edmonton’s apartment market is benefiting from the downtown construction projects centred on the city’s new downtown hockey arena. “All those projects will last two or three years and most of the workers – they are renting from us,” said Lam. One characteristic which sets Mainstreet apart from its competitors is its international approach to staffing and supplying its business. Lam boasts a Mr. Lam has senior financial management background in Asia, Europe and North America while founder and CEO Bob Dhillon (yes, it’s pronounced just like the folk singer), was born in Hong Kong and owns real estate in India. Mainstreet and other real estate owners are still trying to figure out what the historic political sea change in Alberta from the NDP majority government will ultimately mean. Dhillon has already stated publicly the company is vehemently opposed to rent controls. That said, it profitably operates in B.C.’s rent-controlled markets of Surrey, Abbottsford and New Westminster, where it has 2,712 units. The company also has 1,656 units in Calgary and 1,066 in Saskatoon.